Retired and in a happy relationship, Kirk believes his adventuring days are over. But as he returns to Earth for the first time since his apparent 'death' upon the U.S.S. EnterpriseNCC 1701-B, events elsewhere in the galaxy set in motion a mystery that may provide Kirk with his greatest challenge yet. The Enterprise-E, under the command of Captain Jean-Luc Picard, is exploring an unstable region of space on a mission of vital concern to Starfleet when they discover the last thing they ever expected to find: a battle-scarred vessel that is instantly recognizable to every member of Picard's crew. Five years after being presumed lost, the Starship Voyager has come home! The commander of Voyager, Tom Paris, explains that Captain Kathryn Janeway and half the original crew is dead, but if that is true, who is the mysterious woman who has kidnapped Kirk back on Earth, demanding that he assist her against a threat to the entire Federation? All is not as it seems, and soon Kirk is forced to confront the consequences of actions taken thirty years before, as well a his own inner doubts. 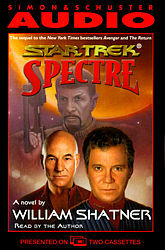 An unforgettable saga peopled by old friends and ancient enemies, Star Trek® Spectre propels Kirk on a journey of self-discovery every bit as harrowing as the cataclysmic new adventure that awaits him.